Winning the Grade 1 Fountain of Youth by four lengths has cleared some of the smoke that arose after Union Rags lost his unbeaten record in last season's Breeders' Cup Juvenile. That narrow decision to then-unbeaten Hansen cost Union Rags the Eclipse Award as top 2-year-old colt, but the towering bay appears on track to reclaim dominance over his division. Braxton noted that the family behind Union Rags is one developed by “Mrs. Wyeth's parents, and she really wanted a filly. It was a colt, however, and Union Rags was a really nice colt. Union Rags is also the last foal of his dam, the Gone West mare Tempo, because Wyeth pensioned the mare after she produced the colt rather than risk her welfare with further breeding. Part of the reason for Wyeth's concern for Tempo is surely the sentimental tie that the now-20-year-old mare has with Wyeth's family. Tempo (by Gone West) descends from a line of bloodstock cultivated over the generations by Wyeth's parents, James and Alice Mills, who had Hickory Tree Farm in Virginia. There they raised some outstanding racers, and they also campaigned such horses as leading sire Gone West, champion juvenile colt Devil's Bag, and others. Mrs. Mills purchased the fourth dam of Union Rags, the lovely High Hat filly Glad Rags, as a yearling for 6,800 guineas from Captain Tim Rogers. Glad Rags became the highweight 2-year-old filly in England in 1965, and the next year she won the 1,000 Guineas at Newmarket. Brought to the U.S., Glad Rags proved a broodmare of remarkable importance and durability for the Millses. She produced two stakes-winning fillies, Mirthful Flirt (Raise a Native) and Terpsichorist (Nijinsky), as well as the latter's stakes-winning full brother Gorytus. The foals out of Glad Rags were some of the prettiest horses I have seen, but Terpsichorist had a great deal of the scope and brawn of her great sire. She stood up quite well to 28 starts in two seasons, winning 11 and finishing second or third in another nine. She was very talented and game and tough. The scopy chestnut Terpsichorist, moreover, is the one who comes next in the sequence leading to Union Rags. The hickory mare did not produce anything quite as talented and tough as herself, but she did have stakes winner Marry Me Do (Blushing Groom), as well as the stakes-placed Dancing Devlette (Devil's Bag) and Thebes (Hansel). Some of the mare's other foals seemed to have a lot of ability, even though they didn't earn black type. Tempo, Terpsichorist's only foal by Gone West, was one of those. A winner in two of her three starts and second in the other, Tempo appeared to have untapped reserves of talent. Then she became a broodmare, and her career as a producer seems littered with promising horses. They won and showed some talent, but there was a little something missing. When matched with the Dixieland Band horse Dixie Union, the puzzle worked out. The first mating produced Geefour, who is stakes-placed. The second mating with Dixie Union produced Union Rags. Frank Mitchell is author of Racehorse Breeding Theories, as well as the book Great Breeders and Their Methods: The Hancocks. In addition to writing the column “Sires and Dams” in Daily Racing Form for nearly 15 years, he has contributed articles to Thoroughbred Daily News, Thoroughbred Times, Thoroughbred Record, International Thoroughbred, and other major publications. In addition, Frank is a private consultant to breeders on pedigrees, matings, and conformation. 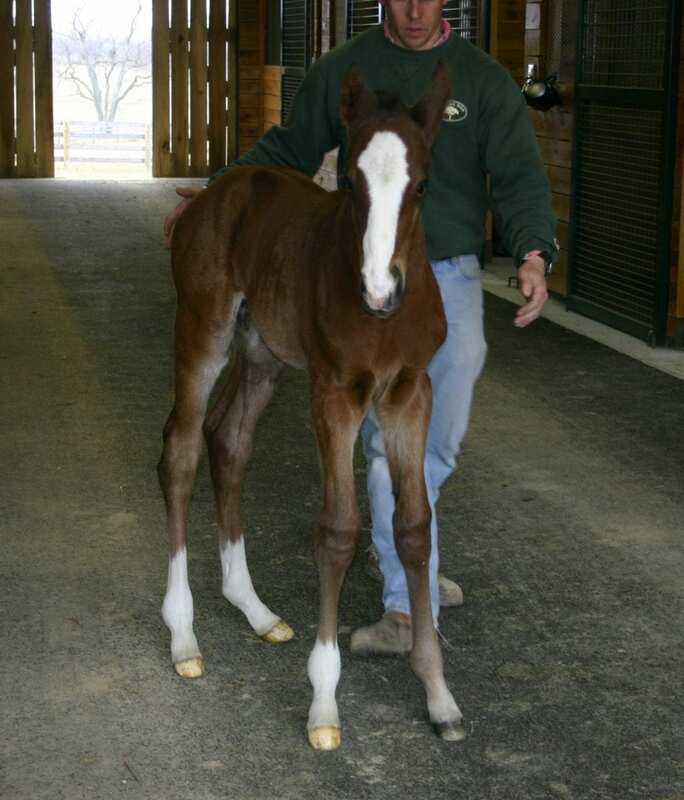 He is a hands-on caretaker of his own broodmares and foals in central Kentucky. Check out Frank's lively Bloodstock in the Bluegrass blog. This entry was posted in Bloodlines Archive and tagged Dixie Union, fountain of youth stakes, Horse Racing, Lane's End, michael matz, thoroughbred, Thoroughbred breeding, Thoroughbred mares, thoroughbred pedigrees, thoroughbred stallions, Union Rags, weekender pedigree by Frank Mitchell. Bookmark the permalink.